This morning it’s the Peaman Birthday Biathlon at Kailua Pier. 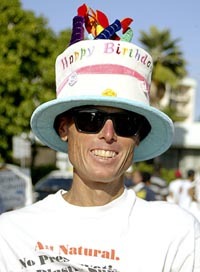 Peaman was decked-out with his birthday hat and participated in the biathlon despite having a broken arm. This is the last Peaman event of the year and not bad of a a turnout on the day after Christmas. 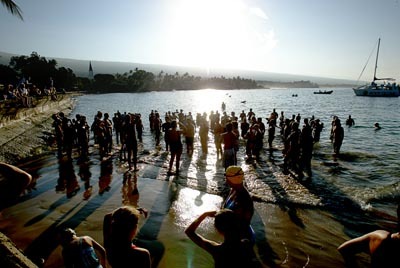 The morning sunrise over Mauna Loa at Kaiakeokua Beach (aka, Dig Me Beach) next to the pier. The Peaman events are free, there are categories for relay teams, finned swimmers and if you can’t make the event on that day you can do the course on your own a week before or after the actual event and report your time on the honor system to Peaman, so long as you get the info in before he offically records it all. 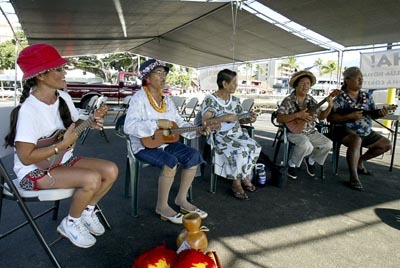 After the Peaman Birthday Biathlon Simmy McMichael, left in the red hat, joined the kupuna at the pier playing the ukulele for visitors from the cruiseship in the bay. Simmy is mom to triathlete/model/TV host Lokelani who participated in the biathlon. 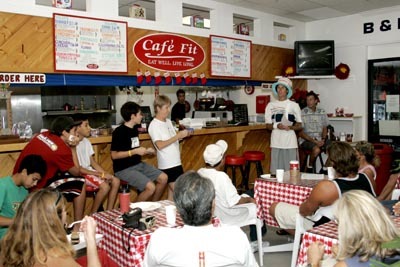 After the biathlon the group headed over to Cafe Fit at The Club in Kona where awards for the year were given out, the perpetual pea trophy and birthday cake for Peaman. Usually the group ends the year with an all-you-can-eat bash at Bianelli’s Pizza but the resturant has closed.